1.5 to 2.0 m of white cotton twill or jersey. This is for both the body and the wings. Mine had a bit of a velour finish and a touch of stretch to it, but I didn’t realize how the feathers would really cover everything. If I had to do it again, I’d save the couple of dollars a meter and gone for a simpler fabric. It shouldn’t be too thin a fabric though as it has to be able to stand up to the weight of the feathers being sewn onto it. It took me this long the first time as I was figuring stuff out, I could probably do it in 12 hr if I had to do it again. 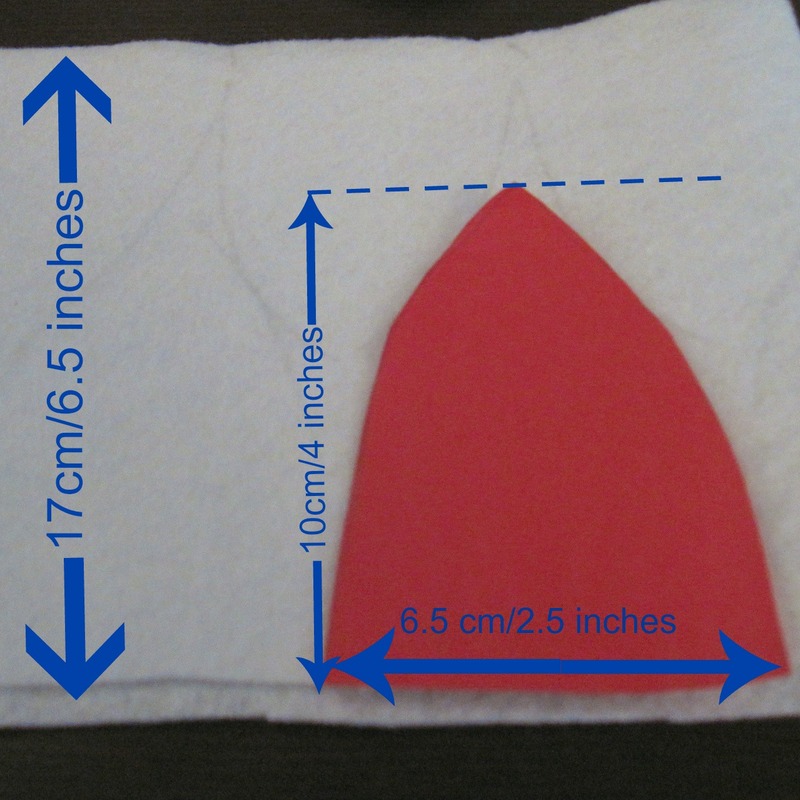 I used the directions from alidamakes.com for measuring and cutting the fabric, but instead of cutting the two pieces of outer and inner fabric, I just doubled the width and cut one of each. 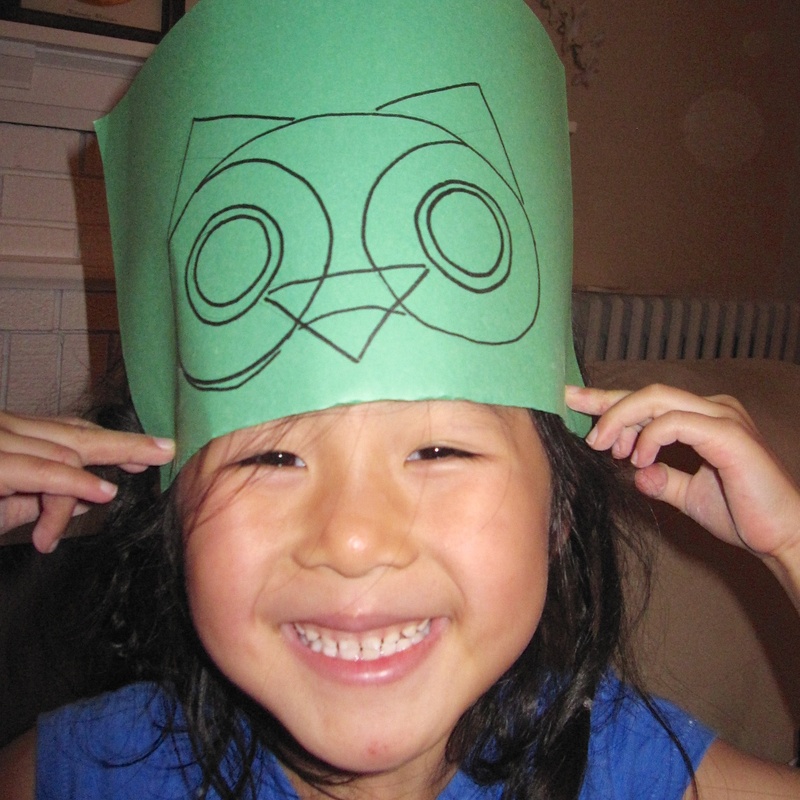 Template for feathers and tracing on felt. 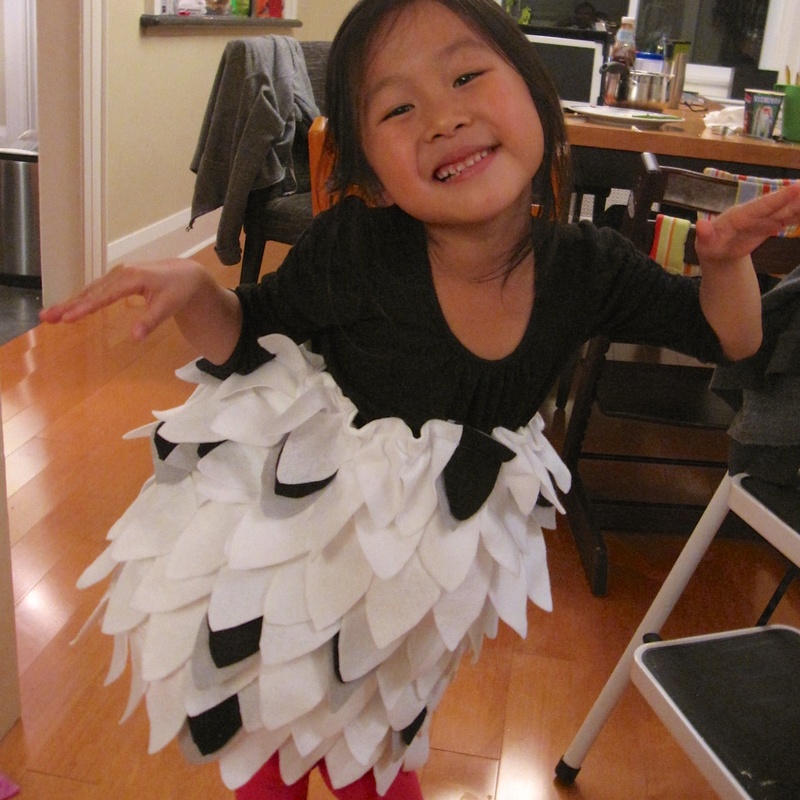 Then I stencilled and cut out a whole bunch of feathers from the white felt. I tried to minimize the amount of felt wasted so I first experimented on paper with the shape. 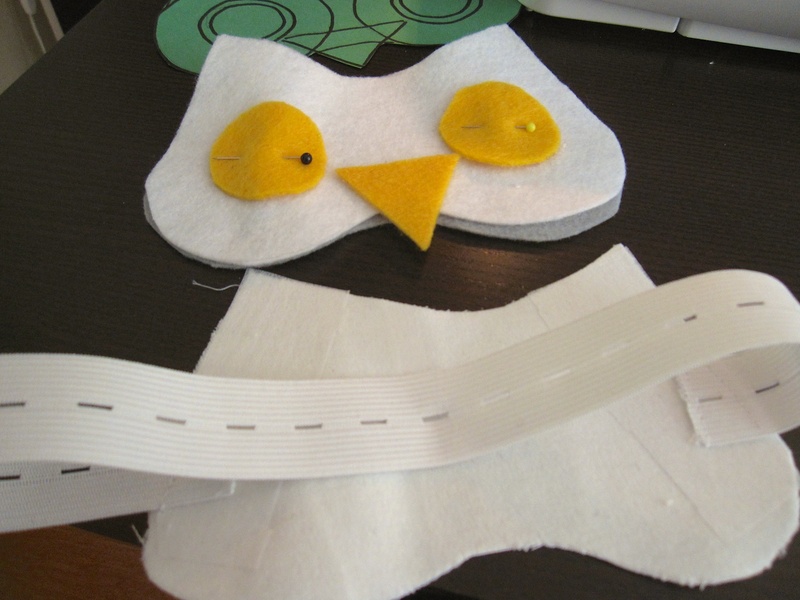 Then when actually working on the felt I would double up the layer of felt so I’d cut two at a time. 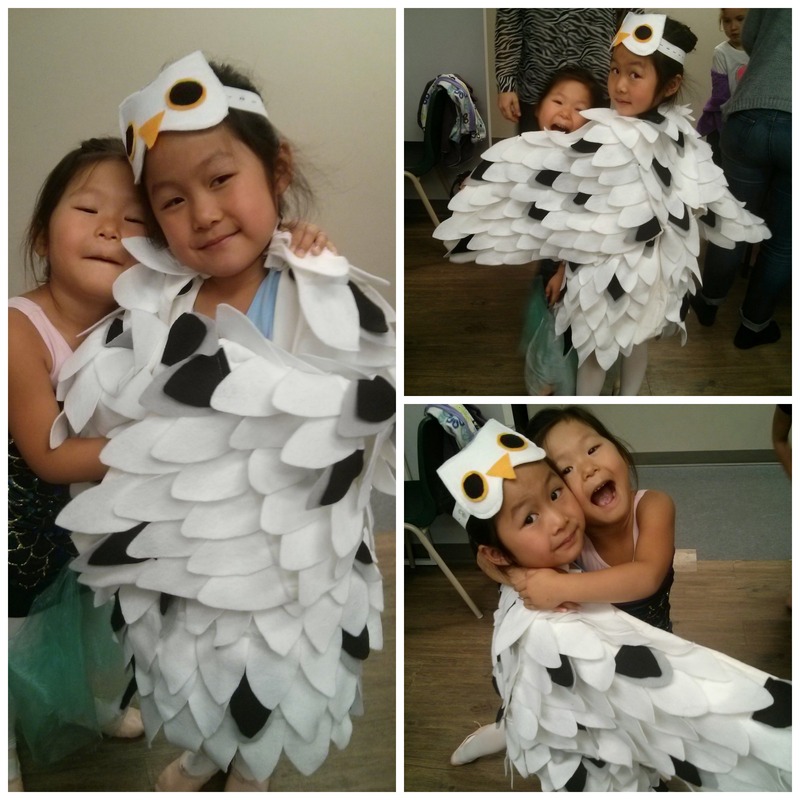 This is us trying out the positioning of the feathers by pinning on her shirt. Feathers sewn on outer fabric of bubble dress. 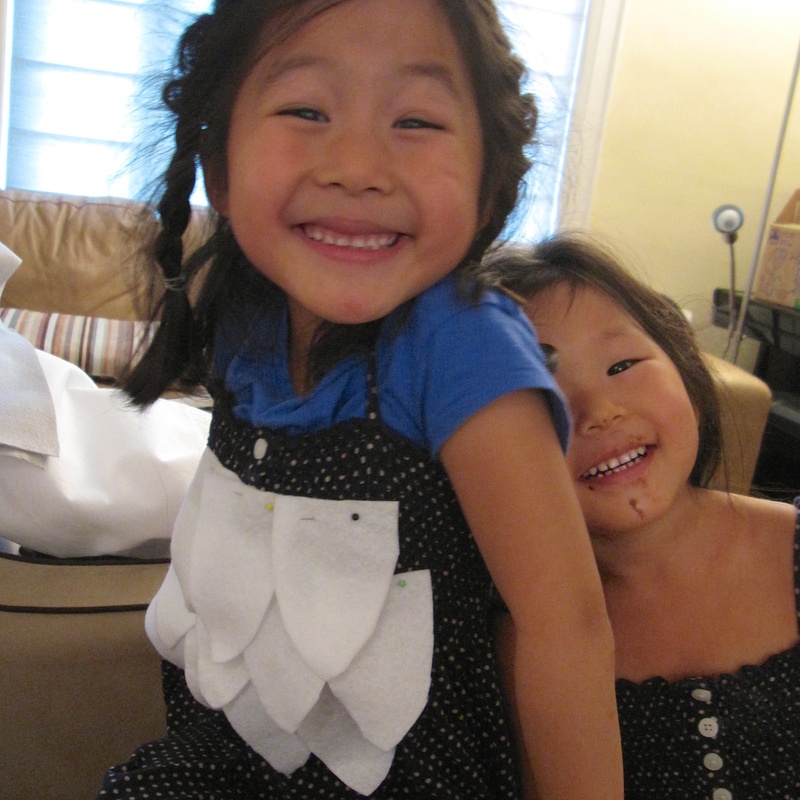 I proceeded to sew the bubble dress as per this tutorial (I had to look up how to do shirring). However, I needed a more significant hole than the 3 inches (8cm) noted for pulling the dress right-side out with all the feathers inside. The hole should probably be at least twice as large. After turning it right-side out, I added a small roll of batting to the inside bottom of the dress before closing up the hole. Tip! I measured the length of her arms from her mid back to fingertip. This gave me the wingspan. 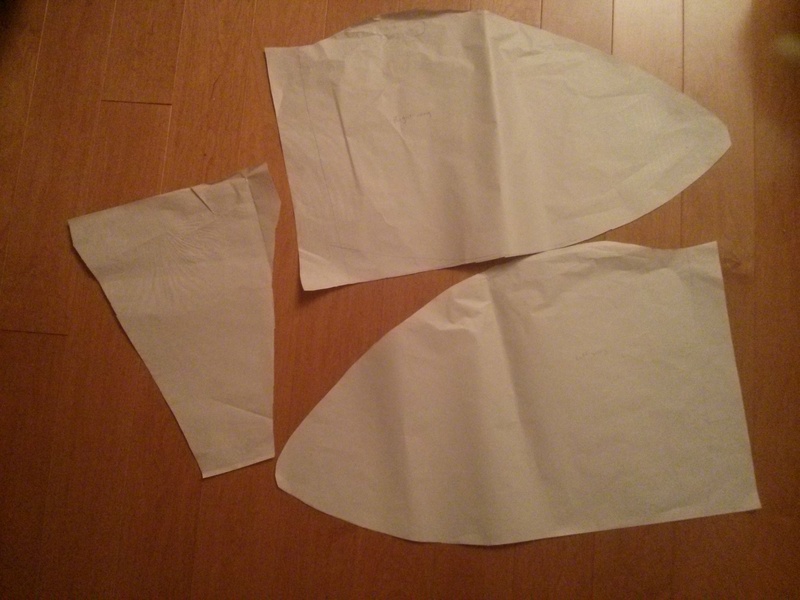 Using large sheets of paper, I drew out a pattern for one wing. Cutting it out, I used it to trace the second wing. After pinning the paper together to test it out, I decided I needed some sort of back piece to bridge the space between the wings, so I came up with this triangular shape. When tracing the pieces onto the wrong side of the fabric, I included an extra couple of centimeters out from the edge to make the hem. Figuring that the wing shapes might need additional structural support, I ironed on some interfacing where I was going to make the hem, and then used the iron to press the fabric where I wanted to hem it. 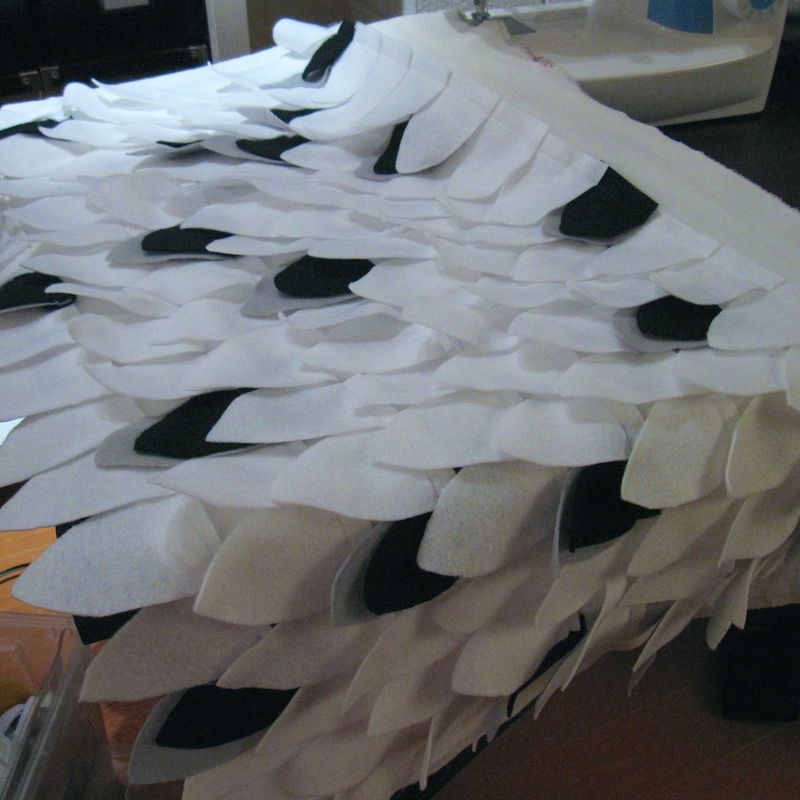 The base of the wings when the pattern is sewn together. 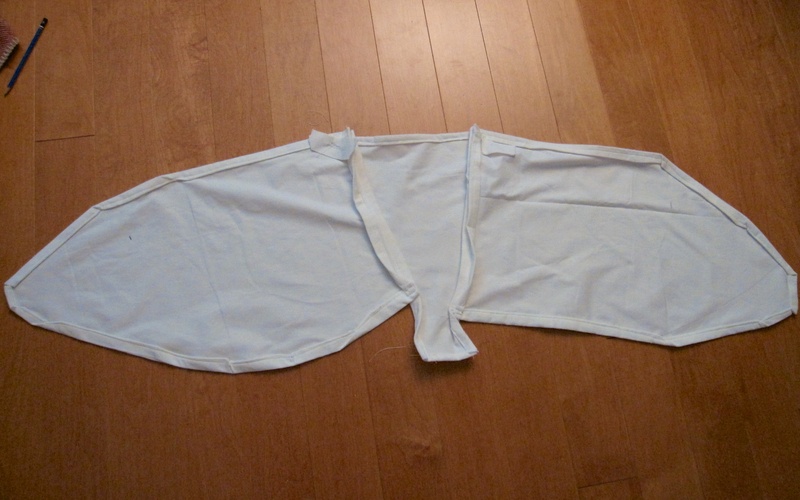 Sewed the wing pieces together. 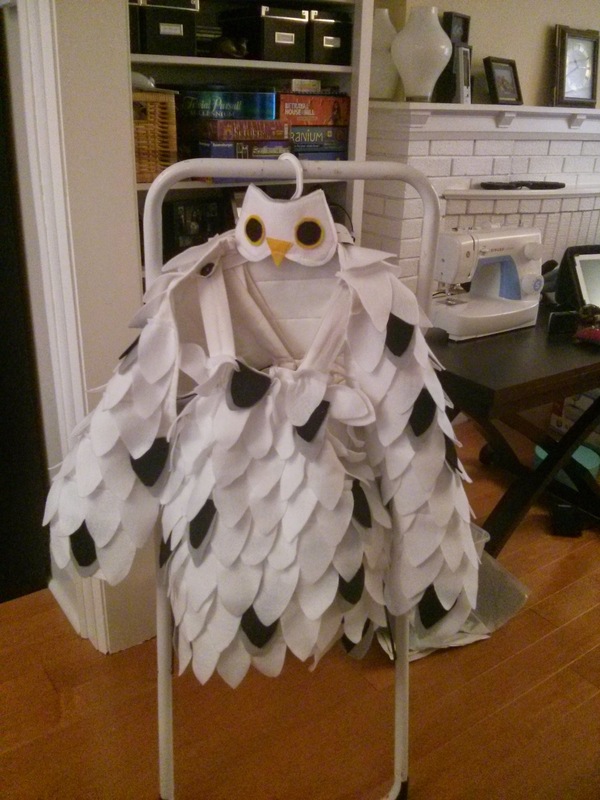 At this point I draped the wings over my daughter’s shoulders while she was wearing the body so I could mark where I wanted the buttons to go (on the dress straps) and where the buttonholes would go (on the wings). I also marked where the elastic wrist straps should go. Close up of the hidden buttonhole. I took 2 small pieces of leftover fabric, used some more iron-on interfacing, and played with the buttonhole feature on the sewing machine to make the reinforced buttonhole. (cool!) I then sewed the buttonhole pieces to the underside of the wings where I marked them, and the corresponding large buttons onto the dress straps. Sewing on some elastics for the wrist straps finished the base of the wings. Lining up and sewing the feathers. 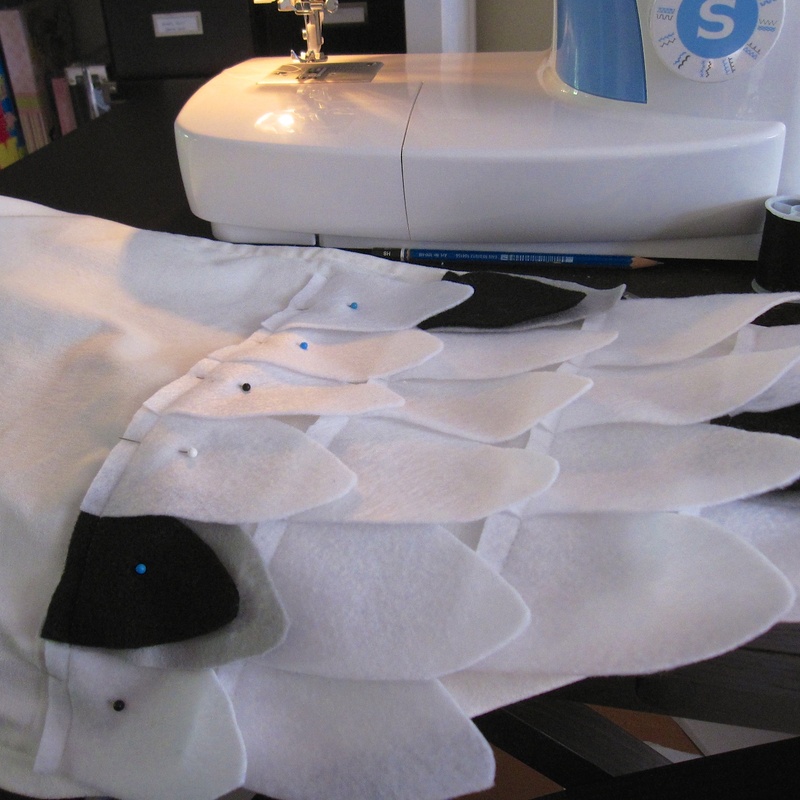 The feathers were then sewed onto the base of the wings using the same pattern as for the body. My husband and I debated whether the feathers should point toward the tip of the wing (like I did them) or whether they should point towards the tail when the wing is extended (I think this is more accurate?). The back piece I sewed it so the edges of the feathers covered the seam where the wings meet the back piece. Now the body and wings are done! It’s going to be a headband as her school doesn’t allow masked costumes. I drew the face out on paper first, using two spools of thread as a stencil to get the nice circles for the yellow and black parts of the eye. Then I traced and cut 3 layers of the base of the face: one on white felt, one on grey felt, and one on the same fabric as the wings. I planned to have the elastic be attached to the stiffer fabric so it can take most of the strain, and then sandwich this layer between the felt pieces. I measured the amount of buttonhole elastic needed with this face piece to be snug around my head, and sewed it on. Please don’t look too closely at the wavy sewing line. 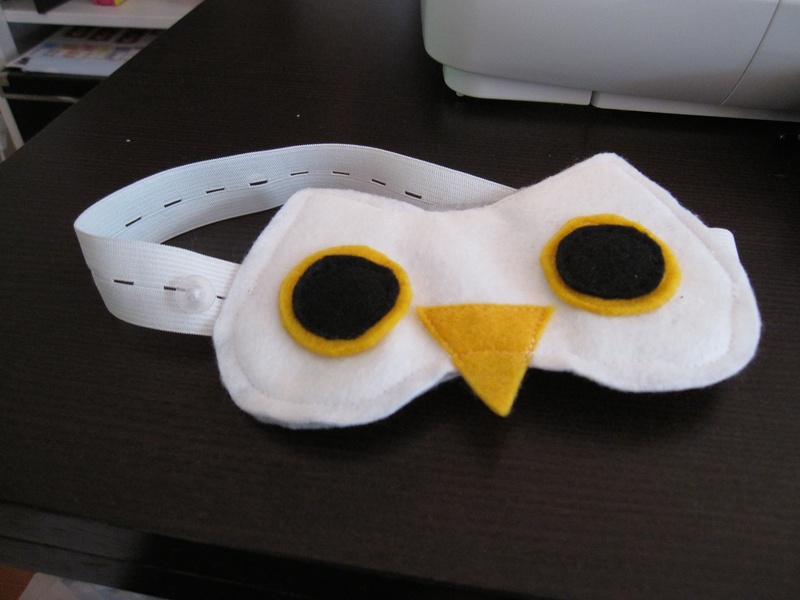 Before sandwiching the pieces together, I sewed the eyes and beak onto the white felt layer. Then I pinned all 3 layers together to minimize the layers sliding around while sewing. Actually, sewing the 3 layers together was a bit of a challenge because most of the sewing I did up until now was in relatively straight lines. Lastly, I sewed the small button to the elastic right before it meets the face piece, so it can be adjustable for different sized heads. Pretty awesome, if I do say so myself. And then the costume was done! Along the way, I had to redo some things when I realized I made a bad enough mistake, and there are many small mistakes that I didn’t bother fixing because it was good enough. But I am so proud of myself that I kind of feel silly about it. Best of all though is that E1 loves it. Hopefully it will last a long time in our family. This is AMAZING! Congratulations on some fantastic work and on making an incredible memory for your daughter! You should be silly proud of yourself. 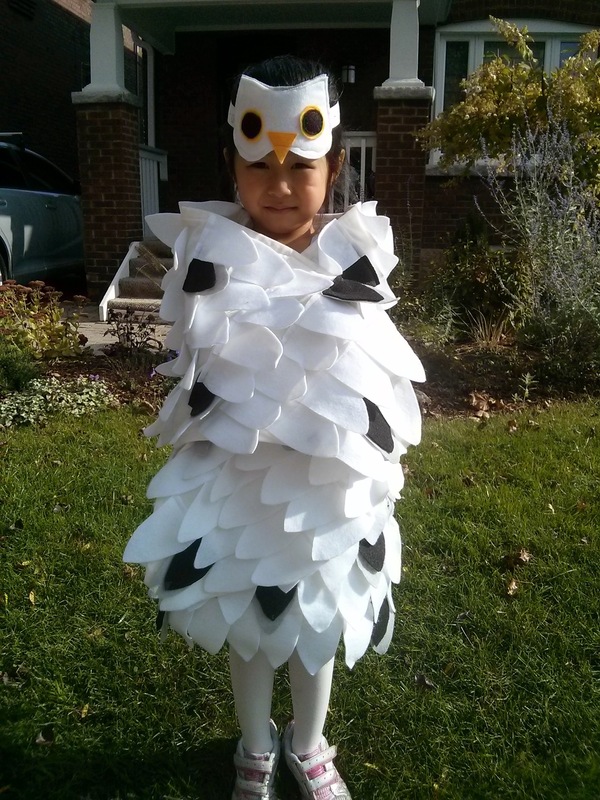 It is a fantastic costume -well-thought out, executed and looks like you had fun. Plus the smile on E1’s face while wearing it, speaks for itself. Well done.